I was walking through one of my favorite farmer’s markets, and you know how there’s usually a general line up: the produce stand, the honey + jam stand, the pickle stand, the ostrich egg stand (yes, there’s always a man selling ostrich eggs), the bread stand, the poultry stand, the plant stand, and the baked goods stand. Well, I was passing by the bakers’ stand, which was filled with mini pumpkin + pecan pies, mini quiches, mini cheddar rolls (maybe it was a mini baked good stands? ), and these hand pies, filled with spinach, onion, and feta. Quick to purchase and even quicker to devour, I ate this spinach pie before I could make it to the end of the market. But I had to have more, so I decided to make it at home. A hand pie, and why I love it so much, is basically a hand-held pastry filled with sweet or savory fillings (kind of like a turnover). Something about holding a personal pie makes it so easy to eat. You don’t need plates or utensils, just maybe a napkin. It’s not like a beautiful tart you present to your guests at the end of dinner, even though you could. It’s a simple, easy, rustic, and beautiful pastry. Usually for a sweet hand pie, a pastry dough or a sweetened tart recipe is used. For a savory hand pie, like this one, I used a pizza dough recipe. And it starts with yeast, water, flour, salt, and olive oil - that’s it! Making dough from scratch sounds daunting and difficult, but it’s quite easy and manageable. You could buy dough or use your favorite. These are rustic hand pies, meaning they’re meant to look handmade - not professional and perfect. Pizza dough is quite elastic so it stretches and contracts as you roll and cut the dough, making every pie look different. The dough is airy, tender and crisp. And when you take that first bite - you might need to sit down for it. Spinach, feta, and onion are a classic combination, and rightfully so. The spinach adds a freshness, the feta a saltiness, and onion a slight tang. You don’t need to precook any of the vegetables and I usually don’t add salt because the feta is already salty. Just add the raw spinach, onion, and feta and it will steam and cook in the oven. Let the pastries cool slightly before eating, but they usually go pretty fast. I love having them along side soup or as a snack, but there are rarely any leftovers. I tried this also with Jarlsberg cheese instead of feta because I had that in my fridge, and that was also really good; because of the meltiness of Jarlsberg, it was definitely more pizza-like. But you could really add whatever ingredients you likr or have on hand (note: cheese is highly recommended). The key to this recipe is simplicity. It’s not about making uniform hand pies, but about enjoying the baking process (and even more, the consumption!). I hope you enjoy this recipe as much as I did. Have fun! Share your recipes in the comments below or on Twitter or Instagram, using the hashtag #friedparsley. This recipe is also on Food52. Check it out! Place the warm water and yeast in a bowl. Let stand for 5-10minutes, or until foamy. In another bowl, whisk together the flour and salt. Once frothy, add the yeast mixture to the dry ingredients, along with the olive oil and stir with a fork until dough comes together (*Note, you may need more or less flour depending on the consistency of the dough; but I like to start with 2 cups, even if the dough is sticky and then add more flour as I knead the dough). Transfer the dough onto a lightly floured surface and knead for 7-10 minutes, until elastic and holds its shape. Flour your hands to help the dough along. Grease a clean bowl with olive oil and place in the dough, lightly brushing the top with oil olive. Cover the bowl with plastic wrap and store in a warm place for 1 hour, or until the dough has doubled in size. Place the dough onto a lightly floured surface and roll out to 1/4 inch thickness. You may need to cut the dough in two and rough out 2 separate pieces, to get more out of the dough. Using a round stencil about 4 1/2 - 5inches in diameter (I used the top of a plastic container), trace and cut out the dough into equal circles (You can cut in any shape or size, just note that cooking time will depend on the size of your pies). You should get about 14-18 circles. Place half the circles onto the baking sheet; these will be the bottom. 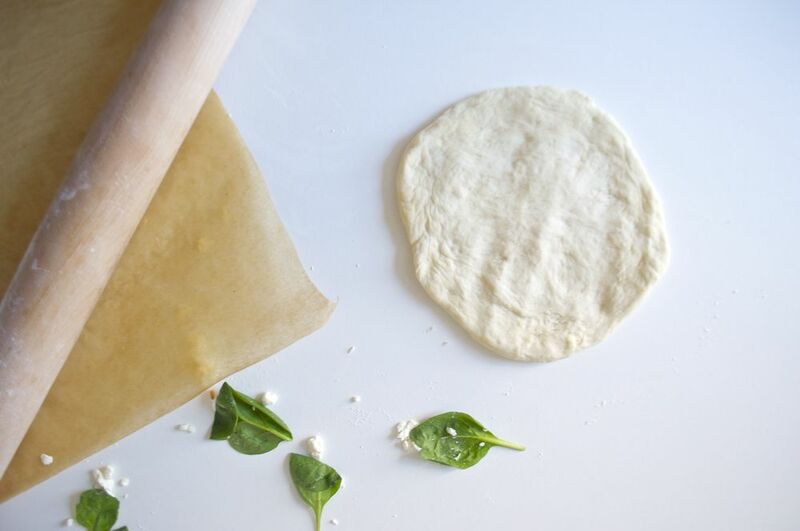 Add the onions, feta, and spinach to the center of each dough circle. Make sure not to over pack and to leave a small border. Lightly dampen the edges with some water. Place the remaining top circles onto each pie and pinch the edges. You can use a fork to perforate the border for a decorative look. Slice a little hole at the top, so steam can get out when it cooks. Brunch the tops with olive oil. Cover the pies with a damp towel and let sit for 45 minutes. Place into the oven and bake until golden brown, about 20 minutes. Best served warm. Enjoy!